DIE Mercurii, 2 die Januarii. Message to H. C. for Conferences on the following Bills; and that the Lords have passed Bodvell's, &c. Bill. Heads for the Conference on the Poll Bill. Scawen's Bill to be restored in Blood. Count. Dowager of Huntingdon, Privilege. Blagrave and Benskin released. Lady Dowager Abergavenny, Privilege. Auson released. To desire a Conference, by a Committee of both Houses, touching the Bill for raising Monies by a Poll, &c.
2. 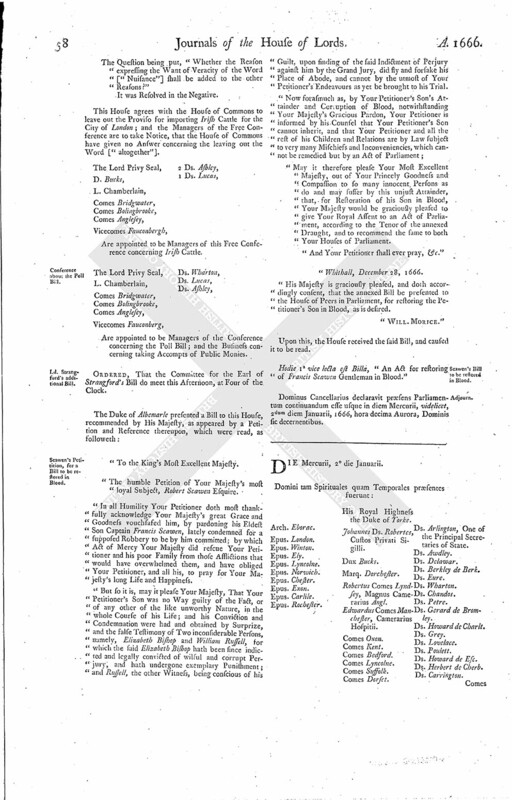 Concerning the Bill for taking the Accompts of Public Monies. Also to desire a present Free Conference, in the Painted Chamber, concerning the Bill against importing of Irish Cattle, &c.
Further to let them know, Whereas formerly the Commons desired a Conference touching the Bill for Coinage, to which their Lordships gave Answer, "That they would return an Answer by Messengers of their own," their Lordships do appoint at the same Time a Conference concerning that Business. Also to let them know, that the Lords have passed the Bill for settling the Estate of John Bodvell Esquire, deceased; and have also passed a Bill for uniting Churches in the Town of South'ton, to which the Lords desire the Concurrence of the House of Commons. ORDERED, That the Three Heads of the Conference concerning the Poll Bill; videlicet, concerning Servants Wages, Pensions, and Officers, shall be omitted, and not spoken of by the Managers of this Conference. ORDERED, That the Committee for the Bill concerning the Lady Abergaveny shall meet To-morrow in the Afternoon, at Three of the Clock. Hodie 2a vice lecta est Billa, "An Act for restoring Francis Scawen Gentleman in Blood." Their Lordships, or any Five; to meet To-morrow in the Afternoon, in the Prince's Lodgings, at Three of the Clock. That they have delivered their Message; and the House of Commons will give the Conferences, and the Free Conference, as is desired. The House was adjourned during Pleasure, and the Lords went to the Conferences; which being ended, the House was resumed. 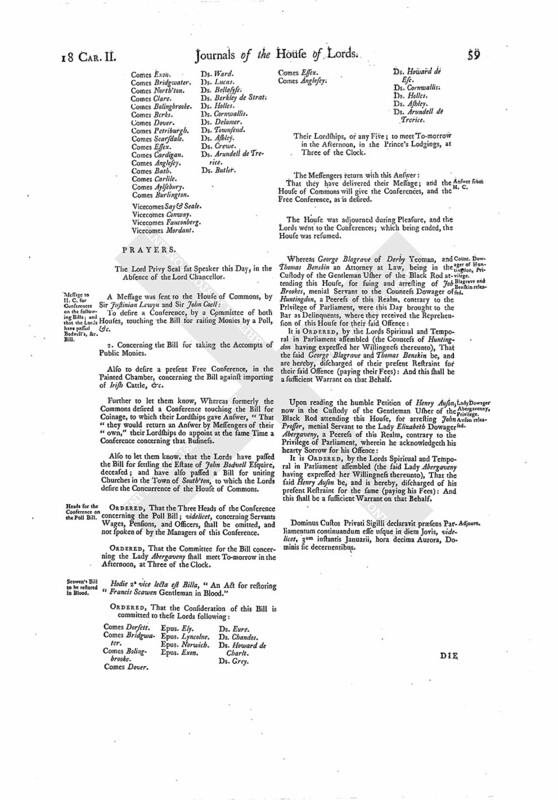 It is ORDERED, by the Lords Spiritual and Temporal in Parliament assembled (the Countess of Huntingdon having expressed her Willingness thereunto), That the said George Blagrave and Thomas Benskin be, and are hereby, discharged of their present Restraint for their said Offence (paying their Fees): And this shall be a sufficient Warrant on that Behalf. It is ORDERED, by the Lords Spiritual and Temporal in Parliament assembled (the said Lady Abergaveny having expressed her Willingness thereunto), That the said Henry Auson be, and is hereby, discharged of his present Restraint for the same (paying his Fees): And this shall be a sufficient Warrant on that Behalf. Dominus Custos Privati Sigilli declaravit præsens Parliamentum continuandum esse usque in diem Jovis, videlicet, 3um instantis Januarii, hora decima Aurora, Dominis sic decernentibus.